Button accordionist Martin McHugh emigrated from Castlerea, Co. Roscommon, Ireland, as a teenager. 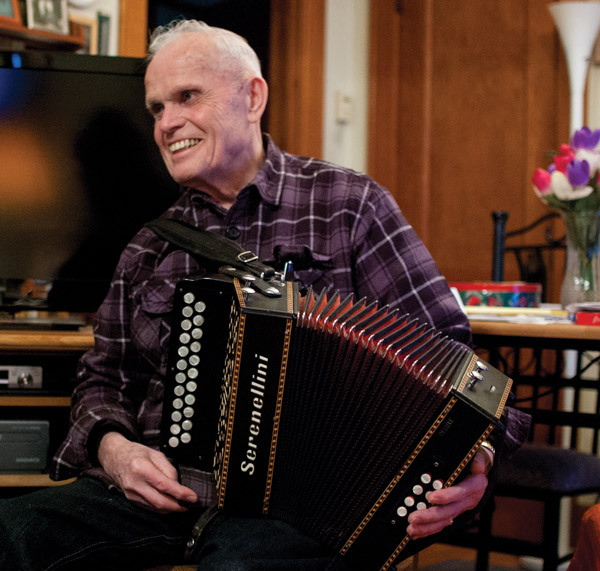 During the 1960s and 1970s he became anchor and fixture at the lively Irish dance and session scene of the Twin Cities of Minneapolis and St. Paul, Minnesota. A great number of budding trad artists has been inspired by his presence and his encouragement. Martin is still an active member of the Irish music community. His accordion playing – rhythms, ornamentation, … – is lively and intricate. Just check out the finishing set of polkas – “Johnny Powell’s / Galway Belle / The Sword of St. Columba / Muirsheen Durkin”. Martin often uses rather unusual settings of his selected jigs, reels and hornpipes. There’s also one slow air featured, “Boulavogue” (best known with the words of a 1798 rebel song), followed by an instrumental version of “The Galway Shawl”, a popular song as well and only recently adapted to 3/4 waltz time. Martin’s disciple Laura MacKenzie persuaded him to record and added flute, whistle and concertina, Irish born St. Paul resident Dáithí Sproule was employed to back up with his DADGAD guitar and sing the old Gaelic ballad “Mo Theaghlach” (i.e. My Family), not too well-known, I only heard it once from ‘Queen of Song’ Elizabeth Cronin (1879–1956).